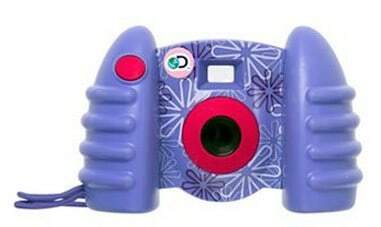 Discovery Kids Digital Photo Camera just $19.99 (reg $69.99)! Kohls.com has started Cyber Week! You can use code at CYBERWEEK check out and get 20% off your purchase! PLUS you can get $15 Kohls cash for every $50 purchase you make. AND shipping is FREE! You can get this Discovery Kids Digital Photo Camera for just $24.99 (reg $69.99). After 20% discount they will be just $19.99! Comes in Purple, Pink and Blue/Green. Full-color, 1.5-inch LCD display provides a clear view. Internal 16MB memory stores up to 120 photos and AVI video clips. USB cable lets you quickly transfer pictures onto your computer. Soft-molded grips are easy for kids to hold. Built-in carrying strap allows for simple transport.